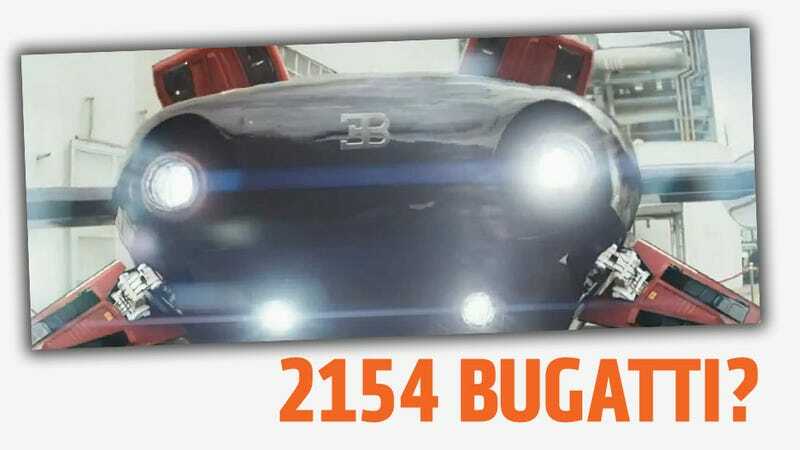 Is This Flying Car In The Elysium Trailer What Bugatti Is Teasing Us About? Bugatti's been teasing us with something that's going to appear of their Facebook page soon, and while it may be just another run-of-the-mill 1200 HP Veyron variant, perhaps it's something more? Like, perhaps, the quad-ion engined, articulated surface flying machine seen in the trailer for Neil Blomkamp's (of District 9 fame) new movie, Elysium? Sure, why not? I mean, yes, it looks like it won't be available until the 2150s, and from what I gather in the trailer, it'll only be available to the very few privileged people living in orbit away from the squalor of a chaotic Earth, but, really, it's about as likely that I'll be able to own a 2150s flying Bugatti as I am a used 2007 Bugatti Veyron with minor accident damage and a strange vomit smell they can't get out of the carpet. Also appearing in the movie: what appears to be a very old and very modified GT-R! It gets flipped into what looks like it may have been a Raptor. So, good news is that in about a century and a quarter or so GT-R prices will get cheap enough to make them almost disposable! Hot damn! So, there's my prediction for Bugatti's New Big Thing: a highly advanced, fictitious air (space?) craft that you're not rich enough to have. Enjoy!